It was billed as the second annual Butterfly Summit, hosted last Saturday by Annie's Annuals and Perennials in Richmond. 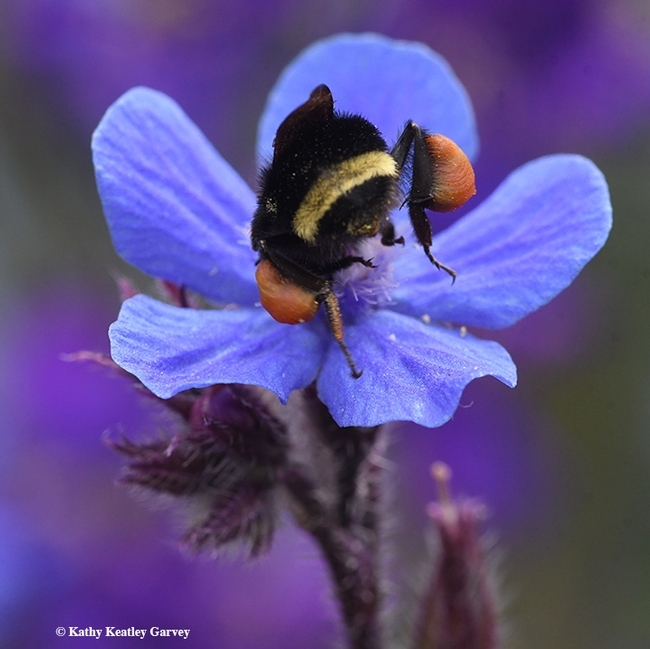 But a yellow-faced bumble bee, Bombus vosnesenskii, foraging on Anchusa azurea (a member of the borage family), apparently didn't like the focus on butterflies. Butterfly Summit? How about a Bumble Bee Summit? 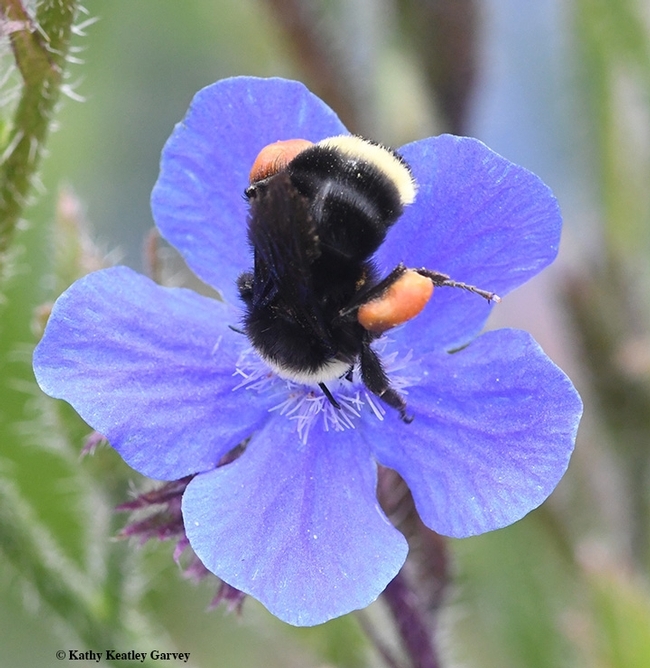 For several minutes, we watched this industrious bumble bee zip in and out of the Anchusa. It zig-zagged between a Delphinium Cobalt Dreams and a Linaria triornithophora, Three-Birds Flying. 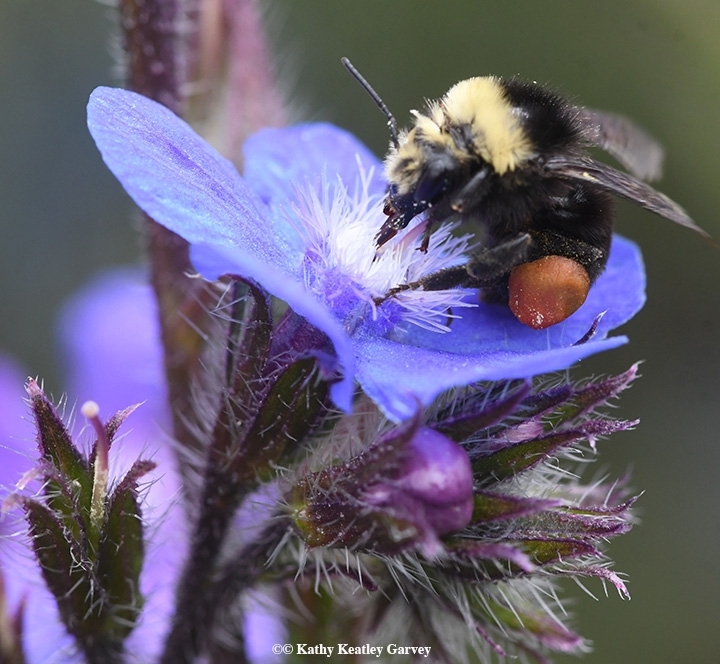 With her heavy load of orange pollen, she appeared to be bogged down, perhaps too heavy to fly? We remember National Public Radio running a piece on "Heavy Loads of Pollen May Shift Flight Plans of the Bumble Bee," which aired in August of 2015. NPR's Nell Greenfieldboyce drew attention to research by biologist Andrew Mountcastle of Harvard University, work published in the Proceedings of the National Academy of Sciences. "Despite what you may have heard, bumble bees do not defy the laws of physics when they fly," Greenfieldboyce related. Fact is, they just fly differently than airplanes. "They flap their wings, and their wings bend and twist as they flap them," Mountcastle told her. He said that when bumble bees carry a pollen load, rather than a nectar load, "they are more stable, but less maneuverable in flight." 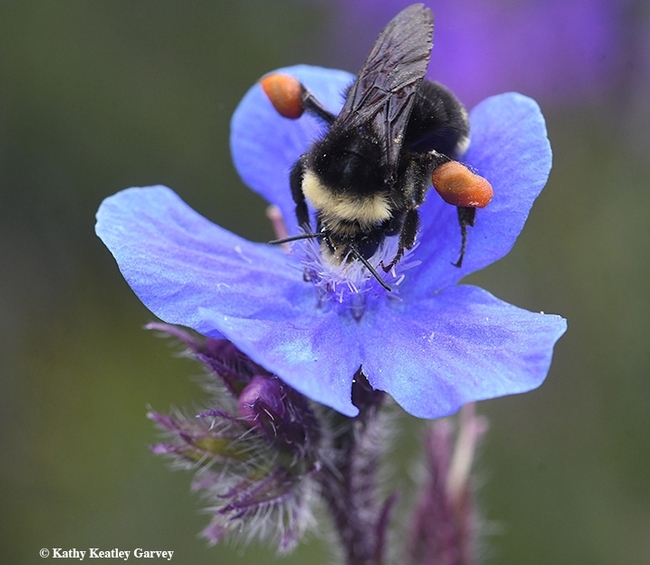 Bottom line: bumble bees are very good at flying, even when they're loaded with cargo (pollen).